NEVER WORRY ABOUT A BURNED OUT BULB AGAIN WITH THIS AMAZING OTOSCOPE! An Incredible Value in an Otoscope. It makes use of the Light Emitting Diode (LED) as it's light source for a superior view inside the ear. 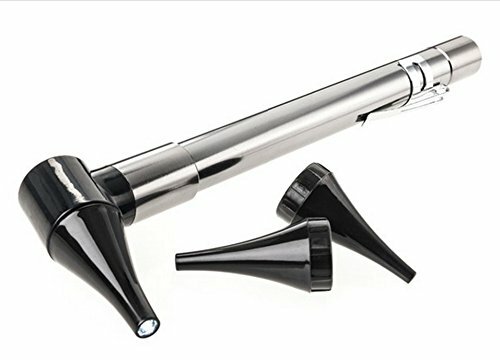 There is no otoscope on the market today that can compare at this price! Why LED? The energy efficiency and durability of this otoscope is simply amazing. The LED light source has no filament to break like a conventional incandescent powered otoscope. The otoscope light source is virtually indestructible and comes with a lifetime warranty that even includes replacing the entire otoscope if the LED bulb ever burns out or stops functioning. You will be absolutely amazed by the amount of light created by the LED bulb. The light produced by this otoscope is full spectrum and not the yellow light typically created by incandescent light bulbs on other otoscopes. With a light emitting diode there is no fragile filament to break so it can withstand repeated dropping or rough handling. The halogen bulbs found on other otoscopes burn very hot and eat battery power, they are also very fragile and easily damaged.